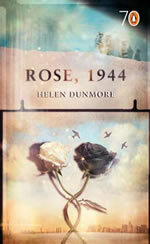 A collection of four stories in the Penguin 70s series, Rose, 1944 contains four stories, including three that are previously unpublished in book form. The stories are Rose 1944, Whales and Seals, Esther to Fanny and Annina, which was first published in Love of Fat Men. Esther to Fanny was first published in a short story anthology, A Day in the Life, published by Black Swan in aid of Breast Cancer Care. The story was inspired by Fanny Burney’s brilliant and moving account of the mastectomy she underwent without anaesthetic in 1811. Each time I read this long journal letter I’m astonished again by Fanny Burney’s courage, her resolution, and her determination to record with such precision and feeling the truth of her experience. You can find this journal letter to Esther Burney in Frances Burney, Journals and Letters, Penguin Classics ISBN 0140436243 (www.penguinclassics.co.uk). The letter is dated 22nd March - June 1812, and in it Fanny Burney explains that it was nine months before she could bring herself to write about the mastectomy. Following the mastectomy, Fanny Burney lived for another twenty-nine years. To read the complete story, click here.